The St. Kitts and Nevis Delegation to Guyana, (left to right) Permanent Secretary in the Ministry of Foreign Affairs, Ms. Kaye Bass; Prime Minister Dr. the Hon. 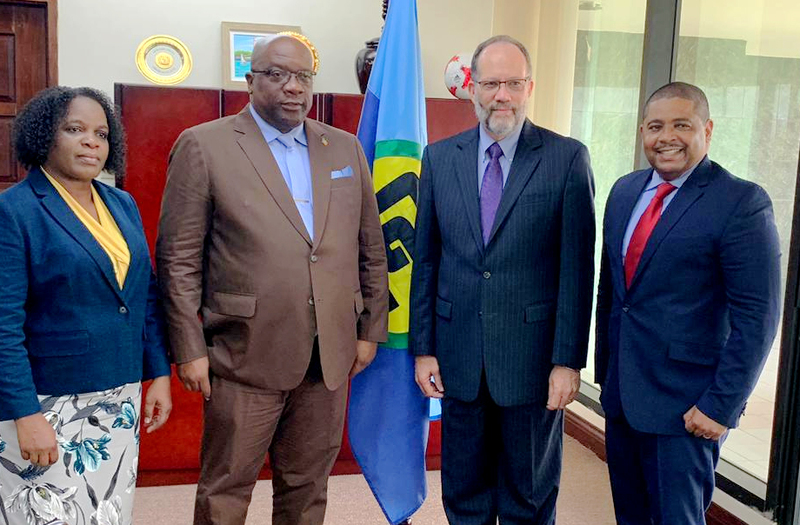 Timothy Harris; CARICOM Secretary-General, Ambassador Irwin LaRocque; and Permanent Secretary in the Office of the Prime Minister, Andrew Skerritt. BASSETERRE, St. Kitts -– The Prime Minister of St. Kitts and Nevis and current Chairman of the Caribbean Community (CARICOM), Dr. the Honourable Timothy Harris, is currently in the Cooperative Republic of Guyana where he is holding several rounds of discussions with top level CARICOM officials, including Secretary-General, Ambassador Irwin LaRocque. Prime Minister Harris’ visit to the CARICOM Secretariat this week comes ahead of the 30th Inter-Sessional Meeting of CARICOM Heads of Government, which will be held in St. Kitts and Nevis from February 26-27. The prime minister is accompanied on his visit by Permanent Secretary in the Office of the Prime Minister, Andrew Skerritt, and Permanent Secretary in the Ministry of Foreign Affairs, Ms. Kaye Bass. On Jan. 24, the Dr. Harris met with Ambassador LaRocque for discussions. The prime minister is expected to meet with the members of the Secretariat’s Executive Management Committee. The CARICOM Chairman will also address the staff of the Secretariat. Later this evening, Prime Minister Harris will attend a special dinner hosted by the Indian High Commissioner in honour of 150 years of Celebrating The Mahatma. On Friday morning, the St. Kitts and Nevis Prime Minister, accompanied by the CARICOM Secretary-General, will meet with President of the Cooperative Republic of Guyana, His Excellency Brigadier David Granger at the State House. Dr. Harris also scheduled to hold discussions with the Leader of the Parliamentary Opposition, Mr. Bharrat Jagdeo while in Guyana. Prime Minister Harris assumed the CARICOM Chairmanship on Jan. 1.